The theme of life and light has colored the Liturgy of this week. Before leading the catechumens into the Mystery of Christ's Passion and Death, the Church presents Christ to them once more as the Light of the world who has power to open man's eyes to his Light. He will veil it for a while during his Passion but it will burst forth in full splendor again on Easter morning. 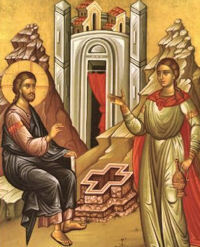 Historically today is the feast of St. Photina, the Samaritan woman at the well. We must forgive our neighbor always. This fraternal charity is the source of strength among the members of the Mystical Body: "If two of you shall consent upon earth concerning anything whatsoever they shall ask, it shall be done to them by my Father". This charity should animate us in giving fraternal correction, which should always be free from all vanity, self-love and desire to humiliate and defame. The Church dispenses Christ's forgiveness through the power of the keys: "whatsoever you shall loose upon earth shall be loosed also in heaven". Christ's pardon of us is limitless. Just as the small quantity of oil, increasing miraculously at the word of Elias, enabled the poor widow to pay all her debts, so the infinite merits of Christ enable us to expiate all our sins. Discuss the idea of forgiveness with your children — emphasizing with today's Gospel that Christ's forgiveness is limitless to those who humbly repent of their offenses against Him. Ask them ways in which they practice this virtue every day, with their sisters and brothers, with their parents, and with their friends. Throughout this fourth week of Lent, often the time when children begin to lose focus or weary of this penitential season, give them something tangible to work on, such as a Lenten Scrapbook, an ongoing activity that will engage their minds and stretch their creativity in putting their faith into pictures. St. Photina was that Samaritan woman whom our Lord met at Jacob’s Well. 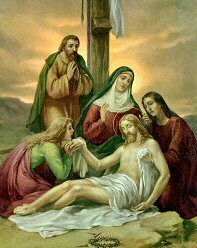 When He disclosed the secret of her profligate life, she believed in Him at once as that Messiah which was to come, and began spreading the Gospel among the Samaritans, converting many. Later, she and her son Josiah and her five sisters went to Carthage to preach and then to Rome. Another son, Victor, was a soldier and had already come to Emperor Nero’s attention as being a Christian. The Emperor summoned the whole family and with threats and tortures tried to force them to renounce their faith in Jesus Christ. Meanwhile, when Nero’s daughter Domnina came in contact with Photina (the Lord Himself had given her the name, meaning “resplendent” or “shining with light”), she, too, was converted. The enraged emperor had the heads of the sons and sisters cut off; Photina was held in prison for a few more weeks before being thrown into a well, where she joyously gave her soul to the Lord.